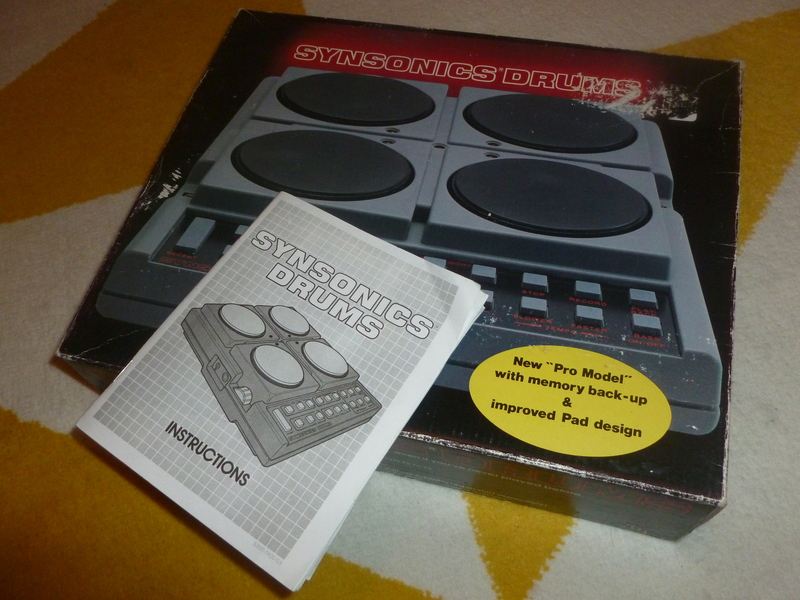 SYNSONICS, Drum Machine from Mattel. 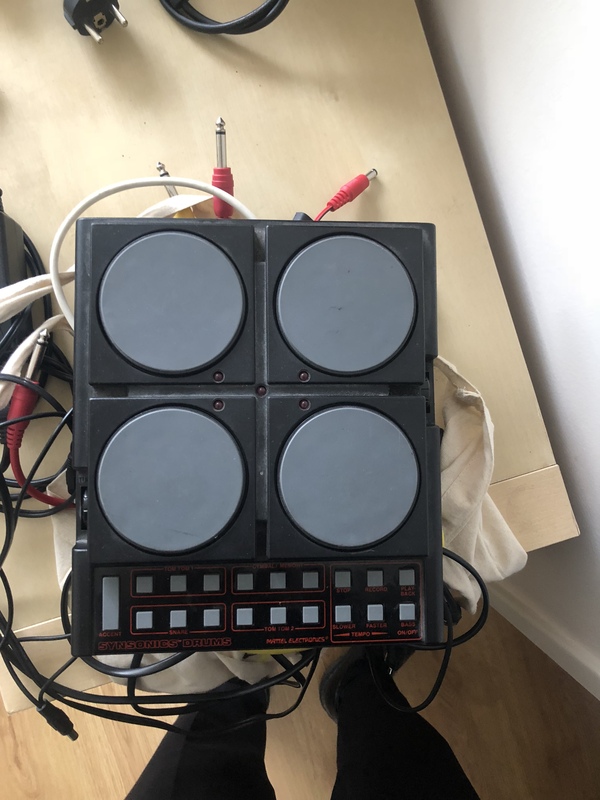 -No MIDI connections. The 5-pin DIN plug on the ct is a dclencheur for a sound (dclencheur may never be released). Stereo output asymtrique. 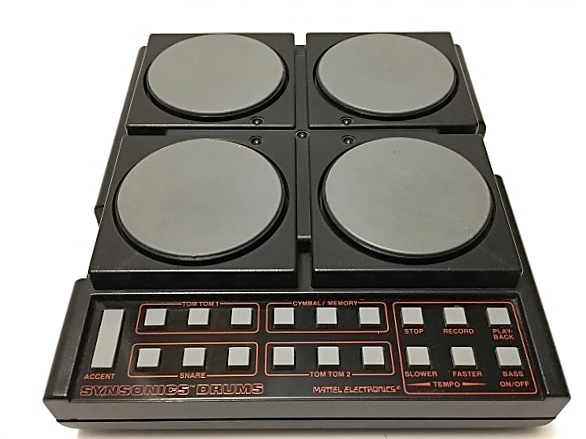 -4 Sounds: bass drum foot (kick), snare (snare), hi-hat (hat), Tom (vol. .. And Nana?). The pitch of the tom is changeable by a small knob on the ct.
-No effect spcial, but ... By moukrave is against sound effect in a song. -Squenceur: Several styles of ready-made rhythms, calls diffrent key combinations. No no no programming, just the steals, but disappears when the unit complexion. 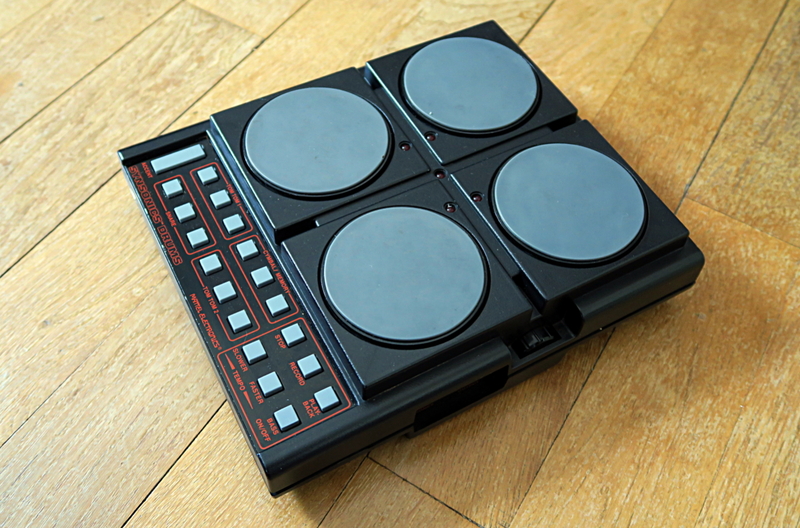 -Configuration: is supplied (battery or mains), you plug an audio cable and presto! 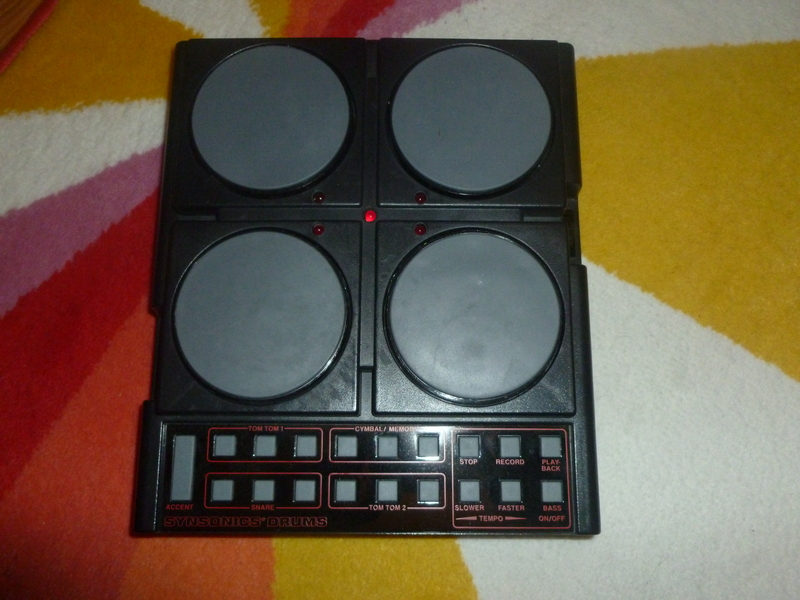 -The sounds are not ditables is a box with some electronic drum sounds. Although he appears toy (making the ct suggests that the designers saw as a step towards this machine other than the toy (that even when Mattel), but aa t consider TFW r as a mere toy by the luxury acgeteurs) even when there is very usable. 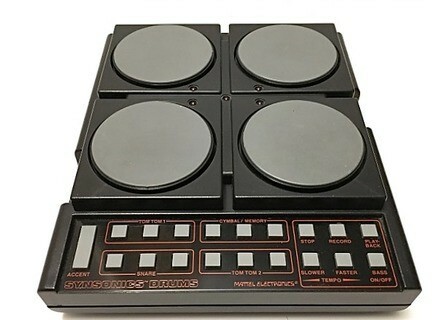 May be more live in the studio, with its 4 large pads dclenchables hand or stick. The small pitch on the ct is funny, you can make "piouuuu" or "pouuuiiiiii" everything goes. -The manual is clear (for those who have yet). Sr succinct well but who needs more? Ben-Sounds ... "bam" (kick) / "tch" (snare) / "tsschhhhh" (hat) / "piouuuuu", "pouiiiiii", "pow", "Pouw", "PIW", "pooow "(toms). I am tempted to say 'electro' free but that does not want to dare to put any o. No well-vlocitaftertouch sr. Dclencheurs and just a pitch, and mini squenceur. I use it (rarely eh) for over a year. -The (-): The volatile memory squenceur (even with the batteries in the unit, it disappears br /> extinction). Piouw. "I (or I had) to other models (CD 550 MKII) but nothing like in style.